As I was crossing the Rhine River at five o'clock, I could see the stage where the presentation of the twenty-two nine-man teams competing in this year's Tour would shortly be taking place. I could hear the music of the opening act and see cyclists streaming towards the stage on the bike path along the river to where I was headed too and could feel the first surge of thrill that I had arrived at The Tour once again--my fourteenth. I had biked to nine p.m. the night before to get within 75 miles of Düsseldorf in hopes of arriving in time for the presentation two days before The Race actually began. No one in the crowd could be happier than me to be here. The plaza in front of the stage was already packed with fans all on their feet. I was so distant that even the large screen beside the stage was smaller than watching it on a television in a bar. I scouted out the cordoned off route that the racers would follow through the narrow cobbled streets of the old city after their introduction in search of a closer view of another screen showing the proceedings. I only had to go three blocks before I found a smaller, less packed plaza with a screen. 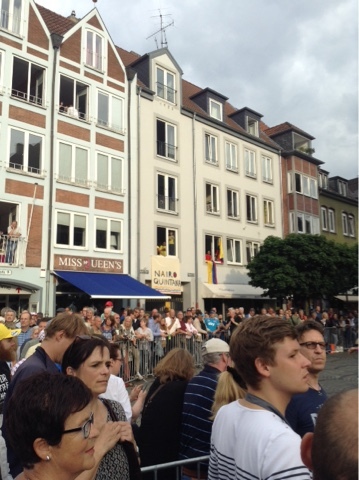 The fans were three deep behind the barriers lining the route, but I could sit on the cross tube of my bike in an open space and gaze upon a good-sized screen flanked by an official Tour boutique selling souvenirs and a stand selling beer--a perfect blend of The Tour and Germany. Just to my right, under a "Bonjour" banner, I could catch a glimpse of the teams as they rode by. 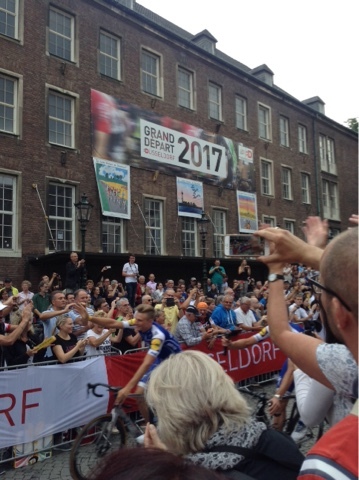 Peter Sagan in his World Championship jersey, who will be vying for his sixth straight Green Jersey, led his teammates through the gauntlet. He has arguably the strongest pair of legs in The Tour, and unarguably, the thickest mane of hair. 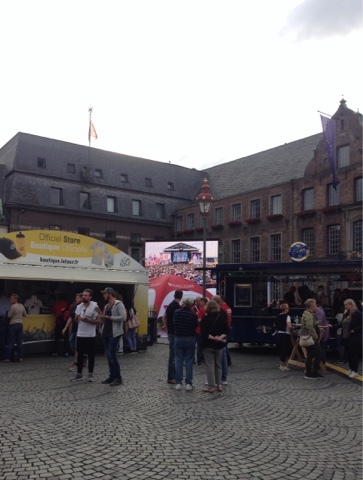 The "Bonjour" on the banner overhead epitomized the theme of the Düsseldorf hosting of the Grand Départ--paying homage to the French. 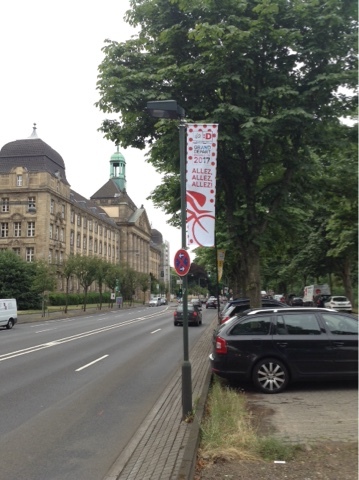 Other banners saluted the French expression "Allez, Allez" exhorting the riders, rather than the German "Hup, Hup." 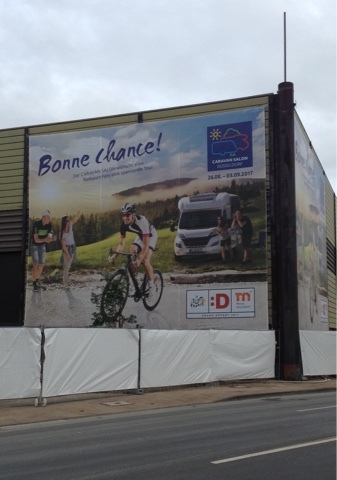 Large billboards wished the riders "Bonne Chance" (Good Luck). But nothing was more French-centric than the abundance of bikes painted red, white and blue, the colors of the French flag. 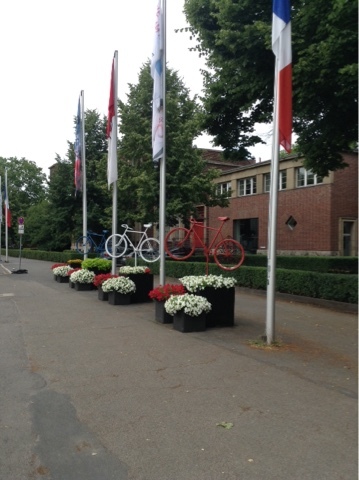 There were still plenty of the more Tour-centric Yellow bikes, but the Germans were certainly expressing their understanding of the French with the red, white and blue bikes. 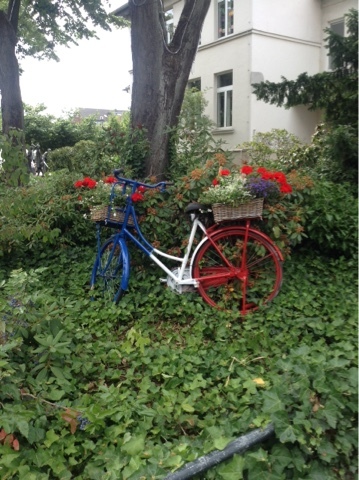 The large town of Meerbusch outside of Düsseldorf on the Stage Two route had bikes painted red, white and blue with a basket of flowers every few blocks. Düsseldorf also asserted its rapport with the French, and perhaps wishing to put behind the many times they've invaded France, with banners on the two bridges the riders will cross on the First Stage time trial proclaiming this a "Tour de Friends." Just as last year, there was a strong representation of fans from Colombia waving or draped in their flag. One group commandeered a second-floor room on the parade route and hung a Quintana banner and a pair of flags. Someone up close under the main stage was waving a Colombia flag on a post throughout the ninety minute ceremony. 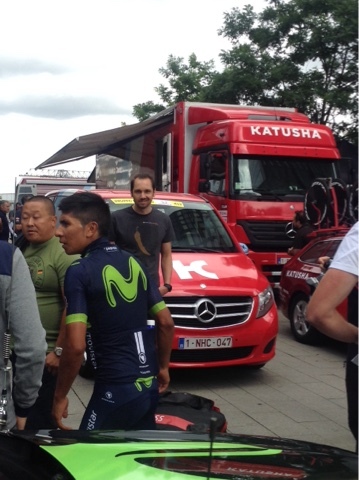 There were no Colombians to be seen though outside Quintana's hotel the next morning when I stumbled upon the deluxe hotel by the old harbor where his Moviestar team and Team Katusha were staying. Quintana happened to be rushing by looking very intent and focused not wishing to linger with the handful of the fans hoping for a glimpse of a rider. Skippy and I had made no arrangements to rendezvous knowing it would happen of its own will. The time came just after the introductions had been completed and the throngs were dispersing. I saw Skippy walking on the other side of the barriers in uniform and helmet, but no bike. I called out, "Mr. McCarthy," and he actually answered to his last name, perhaps recognizing my voice, rather than flinching that he was about to be apprehended by some authority, having had his share of tussles with the powers-that-be over their draconian enforcement of riding on The Tour route. "Where's your bike?" I asked. "Come on, I'll show you," he said. "It's inside." We headed over to a building by the stage. We stood outside as a steady stream of well-dressed dignitaries streamed in. It was the post-presentation party. Skippy was the unofficial greeter. Everyone was in a festive mood. 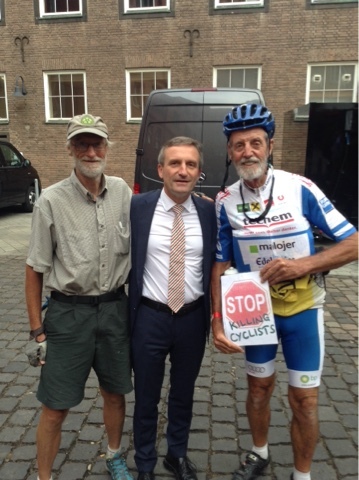 Two-time Tour winner and present broadcaster Bernard Thevenet gave Skippy a handshake and me too. Christian Prudhoome, director of The Tour, did the same. And so did five-time winner Bernard Hinault, looking a bit withered and smaller than when Skippy introduced me to him last year at the Dauphine. It was a bit of a surprise to see him, as he has retired from his podium duties. When the arrivals had thinned to a trickle, Skippy asked the man guarding the entrance if I could just duck in for a photo. Skippy already had clearance. Even though we were well below the dress code, the guy waved us in. There was an open courtyard with several tents. Skippy's first was reaction was, "There's the mayor. Let me introduce you to him." He was all aglow from the huge outpouring of the public and the culmination of all his efforts to bring The Tour to Düsseldorf, just the second German city, after Berlin in 1987, to host the Grand Départ. 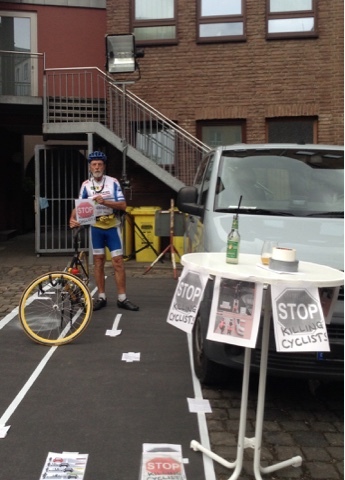 Skippy's bike was off to the side, part of an exhibit in his campaign to make motorists more respectful of cyclists. 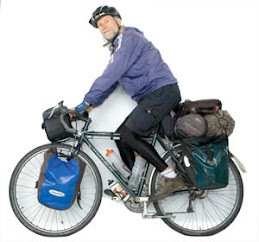 I couldn't linger, as I had an eight-mile ride out to the home of a friend of Ingo, the German cyclist I spent two weeks cycling with in Uganda in 2010 when he was on his way to the World Cup in South Africa. It was approaching nine o'clock. It would be light until after ten, but I already felt as if I would be arriving unfashionably late. The urban sprawl only extended five or six miles in this direction. I was soon out in the country with inviting pastures and forests for camping, but I pushed on, wanting to meet Ingo's friend Joachim. His wife answered the door and said her husband was next door with the neighbors in the adjoining house. Joachim wasn't a cyclist but he knew racing and his neighbor, an ardent cyclist, even more so. The neighbor's wife had an insider's knowledge of the sport as she had worked as a publicist for the Telekom team during the 2000 Tour accompanying the team of Ullrich and Zabel from start to finish. The conversation started fast and furious and never let up. I should have been exhausted, but was temporarily immune to fatigue. I could have pitched my tent in their back yard, but accepted the bed room of their son, who is off on a several month sojourn in Australia, somewhat at the insistence of his parents, who wanted him to get a taste of the world after high school before embarking on college. As with Ingo, I felt an immediate affinity with Joachim and his wife. They had a most welcoming warmth and genuineness. They invited me to join them the next evening for a dinner party at a friend's who had a balcony overlooking a concert. It was hard to decline, but it would have been a late night and I needed to stockpile some sleep, as the day after my race to keep up with The Race would begin. I'd had a good test with my nine-day hard push to get to Düsseldorf culminating with back-to-back days of biking until after nine p.m., as would become the norm. I was much in need of the relative rest day I've just had after the presentation of the teams with just 35 miles of soft-pedaling about Düsseldorf and riding the nine-mile time trial course along the Rhine and through the city center. 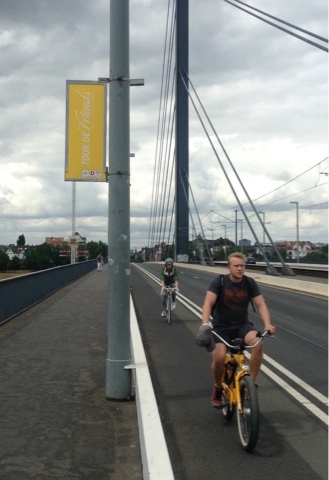 It was extra easy on the legs doing it on an unburdened bike thanks to Joachim and Ingo. Quite a few of the racers were sampling the course as best they could in the heavy traffic on their time trial bikes with disc wheels. 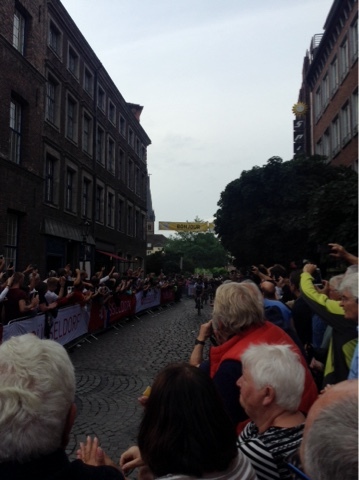 Peter Sagan passed me practicing bunny-hopping curbs. I stopped by the tourist office and picked up a 76-page booklet on everything one needed to know about the Tour's visit to Düsseldorf. It included a full page photo of The Devil accompanying a page of Tour trivia. He's so synonymous with The Tour, he wasn't even identified. I haven't seen him yet, but look forward to that as well. The time trial doesn't start until 3:15 on Saturday. I'll watch the riders warm up,and maybe catch some of the caravan, but then I'll start riding the Stage Two route back towards Belgium on roads I've already ridden. The legs will have a little extra pep to see them anointed with the Yellow Course Markers. Thanks for taking us along again. Great pix and commentary.